Summer goes by so quickly. Before you know it, the kids are heading back to school and those carefree days are over for the year. 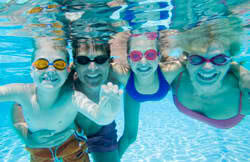 While there is still time, why not make the most of this precious summer season by maximizing your outdoor family time? Being outdoors on sunny summer days helps boost serotonin levels which create feelings of well-being. This means outdoor play isn’t just great fun and a special time for creating summer memories, but also helps increase your energy and overall happiness. So soak up the sun (in moderation and with sunscreen, of course) and capture the precious moments at each sunshiny opportunity. Here are a few ideas to help. You don’t have to have a special occasion to celebrate fun time with your family and friends. Invite everyone over, toss something on the grill, splash around in the pool, or make up some fun yard games. Just enjoy some special time together. Everyday life can get so busy that we don’t always take the time we should to simply enjoy those closest to us. So whatever the excuse, celebrate family and friends. Celebrate life! Have a camera (or cell phone camera) at the ready and snap away! Ask friends and family to do the same and share photos. The kids can even get in on the fun, which is a great way to get a child’s perspective and some insight into what they have enjoyed or found exceptionally special. Taking videos is another fun way to capture everyone’s antics and add to the mix of summer memories. You are the paparazzi and your guests are the stars. Take the time to look back at all those special moments that made your summer special. Create photo albums or collages, print out pictures for framing or send to guests as a special “remembering the fun” sort of gift. Not only have you had a wonderfully fun season, but you’ve captured summer memories that will last a lifetime.